Rangers will have a "better, bigger pitch" for their Scottish Cup quarter-final replay against Aberdeen, says manager Steven Gerrard. The former Liverpool captain was unhappy at the state of the Pittodrie surface as the teams drew 1-1. They will meet again at Ibrox on Tuesday, 12 March. "Aberdeen trained on the pitch yesterday and it hadn't been rolled, it hadn't been cut," Gerrard told Premier Sport. The home side led through Sam Cosgrove's 11th-minute penalty and dominated much of the first half before Joe Worral levelled from a corner four minutes into the second. Andrew Considine spurned two huge chances for Derek McInnes' men with Rangers threatening on the counter-attack. 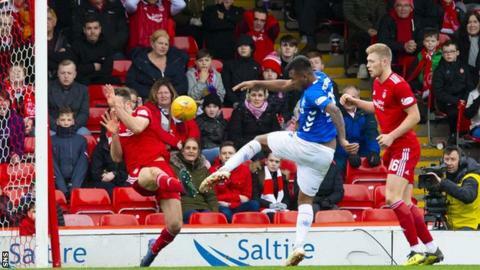 "It was windy, there was a lot of ball in the air, and Aberdeen are really effective at turning games physical. Second-half we matched them more," Gerrard added. "Now we've got a full Ibrox [for the replay], I'm sure they'll be behind us, we've got a better pitch, a bigger pitch and hopefully we can play more like Rangers next time." McInnes, whose side have beaten Rangers in Glasgow twice this term, believes Aberdeen were "good value to win the game". "Disappointed we haven't won the game from a winning position," he told BBC Scotland. "We've lost a goal from a set-play - that and the fact we haven't scored a second goal were the only disappointments. "We had better chances, more pressure on Rangers' goal than was on our own. Although they had a lot of possession between centre-backs in their own half, we were very good in terms of them not opening us up and having too many chances. "We set out to try and be as attacking as we can, we broke well, looked after the ball in certain areas, and I thought we were good value to win the game."